Bienvenidos….Welcome to the “Rain Forest”, can’t say the brochure did not warn you. It will probably rain, but don’t let that stop you. Manuel Antonio National Park is in full bloom which attracts frogs, hummingbirds, and butterflies. It is also baby season here in the jungle so look closely; a lot of monkeys and sloths are carrying babies on their backs. The Humpback whales and their calves are still here so get to Marina Pez Vela for many options to view them as well as world class sport fishing. Our rivers are also flowing so check out Quepoa Expeditions or Tucanes Tours for some thrilling rafting. Don’t forget the 7th Annual Quepos Open Tennis Tournament being held Nov 11-12 and finals 18-19 at the Tennis Club Quepos. Our many fine restaurants are serving up your favorite culinary delights. It is a good idea to call ahead this time of year. (Telephone Directory is on Page 72) We would like to wish everyone a Wonderful Thanksgiving. Toys for tots will have their collection boxes around the area. so let us help the children by dropping an unwrapped gift to help brighten someone’s holiday… Santa Clause cannot do it all himself. We would like to welcome our new advertisers this month: Costa Rica Real Estate Services, Jolly Roger, Ocho Tejas, Osa Thyme, and Vista Bellena. Bienvenidos… Welcome and let the fun begin. Our amazing beaches to stroll, surf or just tranquilo await you. For an over the top view of Manuel Antonio National Park try parasailing with Aquas Azules. World class sport fishing and a fleet of boats to get you there are waiting at Marina Pez Vela. We have tours from skydiving (Skydive Costa Rica) to snorkeling (Sunset Sails) and everything in between. Whether you want to relax and enjoy the nature with Kayak Lodge or Tucanes mangrove tours, or for a little more adrenaline try white water rafting with Quepoa Expeditions. Our mangroves and rivers are as magical as our coastlines. To experience the jungle canopy try zip lining with Titi Canopy Tours. Or the first of its kind the Eco-Tram at Hacienda Baru (tell Jack we sent you) where you can get up close and personal with nature. August is the beginning of whale season so while enjoying your cocktail at our many fine restaurants with a view, pay attention off the coast. You never know when a pod of Humpbacks will swim by. 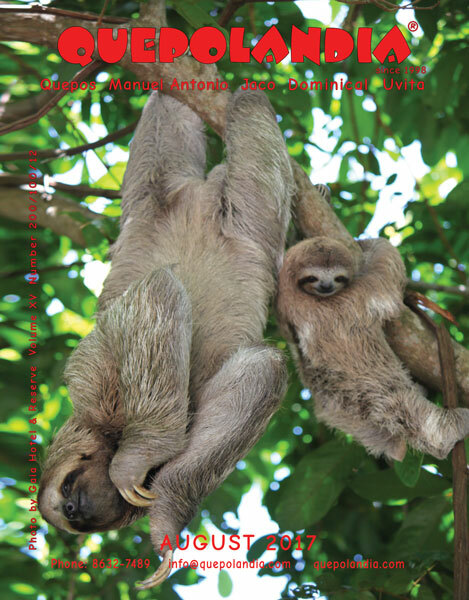 We want to thank Gaia Hotel & Reserve for the mommy Sloth cover. We also want to wish all you ladies a wonderful Mother’s Day (Aug 15). We would not be possible without you. So don’t make mom cook take advantage of our incredible selection of restaurants in the area. I am sure she would also love a massage or a family portrait (Sarah Yunker Photography). Moms… ENJOY YOUR DAY!!! We would like to welcome our new advertisers that help make this magazine possible: E&T Escrow and Trust, Manuel Antonio Estates/Palmas Pacifica, & Get It Here Jerry. We hope you enjoy our magazine and it helps guide you through this enchanting paradise we call home. You can always follow and share us here and on facebook.com/quepolandia. We appreciate your comments and photos. May/June brings the beginning of “green” season and turtle season. We would like to thank the Matapalo Beach Sea Turtle Conservation Project for all the work they do in protecting the endangered sea turtles that come to our beaches to nest and lay their eggs. Also to Gunnar Ebbesson for the great cover. Don’t miss the PAWS 6th Annual Elegant Evening of Fun at the Runaway Grill on June 17. It is an outstanding event at an outstanding location for an outstanding cause. We would like to thank our new advertisers to this magazine…..Carlos Herreros/Coldwell Banker Relocation Services, Fuego Brew Co., Hidden Bay Marina View Properties, Marina Pez Vela Commercial Plaza, Marina Pez Vela Villas, Quepos Yacht Sales, & Waterfalls Manuel Antonio. And new our contributor Danni Coyote. We hope you enjoy are magazine and it helps guide you through this enchanting paradise we call home. You can always follow and share us here or on facebook.com/quepolandia. We appreciate and welcome your comments and photos. Bienvenidos/ Welcome to the land of Pura Vida. We are here to help make this an unforgettable vacation. April is a very busy month here with Semana Santa being one of the biggest weeks of the year. So have patience, relax, and enjoy the celebration. April should also bring a little rain to help cool things down a little and provide some incredible sunsets. So get to one of our many restaurants such as El Sol or d’Tapas at the beach. Aqua Azul or El Lagarto on the mountain or Mira Olas at the Best Western in Quepos for spectacular sunset views and delicious cocktails. In Dominical check out the river view from Mono Congo. Bring your camera as we are always looking for great cover shots. Marina Pez Vela will be in full swing this month hosting the Offshore World Championships with top team teams from around the world competing for the Championship. Thank you Keiber Cruz for the cover. Great shot of last year’s OWC start. Don’t forget Movie Night Under the Stars every Friday night, a great night for the entire family. Be careful this time of year the rip tides can be strong, remember to swim sideways parallel with the shore & not into the currant, and don’t forget the SUNBLOCK. We would like to welcome our new additions this month, Aurea Designs, Casa Moderna, Carlos Herreros at Coldwell Banker, and Manu Villas….. So please let our advertisers know we sent you. We hope you enjoy the magazine and it helps guide you through this enchanting paradise we call home. You can always follow and share us here or on Facebook. We appreciate and welcome your comments. Bienvenidos… Welcome to the tropics. We knew you were coming so we turn up the heat. So take off those layers and forget about those snow shovels and enjoy this Pura Vida weather. Whether you are here to relax at our many wonderful restaurants, explore our National parks, fish, surf our beach, zip line through the sky, raft our cool rivers, or a nice sunset horseback ride. This magazine can be your guide to the best this area has to offer. Marina Pez Vella will be hosting the month long Festival of Aqua. In addition to a fleet of boats, spectacular restaurants, great air conditioned shopping. It is also home of Gelateria Amorosi so cool down with some of the area’s most delicious ice cream & treats. Tell them we sent you, our advertisers love to hear it. Don’t miss Movie Night under the Stars a wonderful night for the entire family. Congratulations to Matt Rabenstine and Team Billfish for winning the 6th Annual Quepos Billfish Cup. For all you basketball fans March Madness is upon us. Catch all the action and great food at Sancho’s Restaurant on the mountain and at the all new Double Hook Sports Bar at the Marina. “Lets go Nova repeat”. 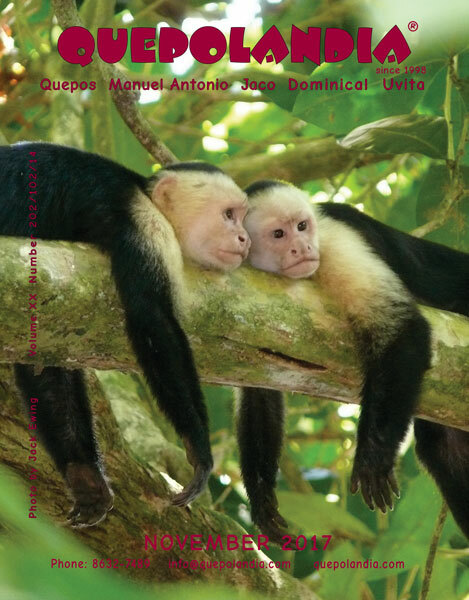 Respect to the Howler monkey and to Rodolfo Guzman for the March cover. In addition to the ONLY Ecotram in Costa Rica, Hacienda Barú has just added their newest attraction, The Monkey Challenge…Do you have what it takes? We want to welcome to our pages Private Chef Kimberly Cubillo & Raw Foods Costa Rica. We hope you enjoy our magazine and it helps guide you through this enchanting paradise we call home. You can always follow and share us here or on Facebook. We appreciate and welcome your comments. A lot is happening here in February. For all you rafters the class 5 Chorro is now open so have Quepoa Expeditions guide you to a spectacular adventure. Our rivers are as magical as the beaches and should not be missed. Catch the Super Bowl, Feb 5th, at Hawg n Bill on the beach, Sanchos on the mountain and Marina Pez Vela will have it on the BIG screen in Quepos. Don’t forget movie night under the stars at the marina. A great night out for the whole family and it is free. Also at the Marina…check out the Quepos Billfish Cup, Feb 2-4. Time to start thinking of that “special” person, Valentine’s Day is almost here. So make your reservations at one of our fantastic restaurants Arbol, Gabriella’s, La Mansion, Mira Olas, or Victoria’s…just to mention a few. We also want to welcome back the seventh annual Envision Festival on the 23rd to 26th in Uvita. Four days of music, yoga, artists, and workshops to help open our minds to making this a better planet…. TOGETHER. Spreading peace, love and knowledge not footprints and waste. We would like to welcome our new and returning advertisers that help make this magazine possible……Castillo del Sol, Comida de Vida, Los Amigos Sushi, Mono Azul Golf Cart, Reel Deal, Riding Adventures, Seguros Largaespada, Shana Hotel, Sonia Reiki and White Eagle. 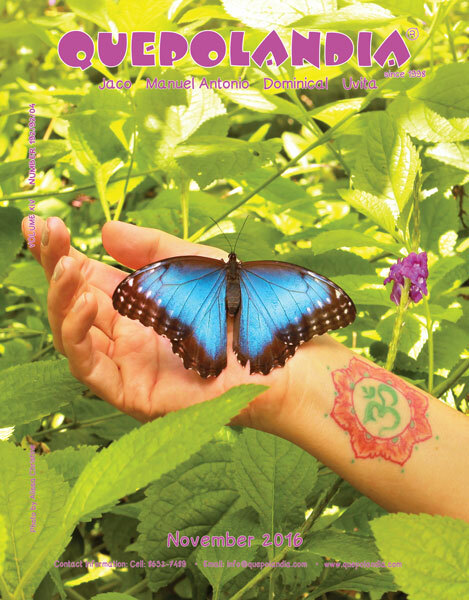 We hope you enjoy our magazine and it helps guide you thru this enchanting paradise we call home. You can always follow and share us here or on Facebook. We appreciate and welcome your comments. Bienvenidos…Welcome 2017, we hope you had a wonderful Holiday. High season is upon us in Costa Rica and we are glad you are here to be part of it with us. Green season has provided us a beautiful backdrop to begin this new year of adventure. Our magazine is filled with the best of the best that the Southern Pacific Zone has to offer and should help your stay here be a trip you never forget. Try something new this year like sport fishing for a record marlin (Marina Pez Vela). Zip Lining thru the tree tops (Titi Canopy). Paddling thru the mangroves (Tucanes Tours or Kayak Lodge). Hiking thru one of the most beautiful National Parks in the world. Just chillin on the beach? Try parasailing (Aquas Azles) or learn to surf (Blue Horizon or Marco) they will have you hanging ten in no time. So let the “Pura Vida” lifestyle set the pace for your 2017. Life is short….GO LIVE IT! 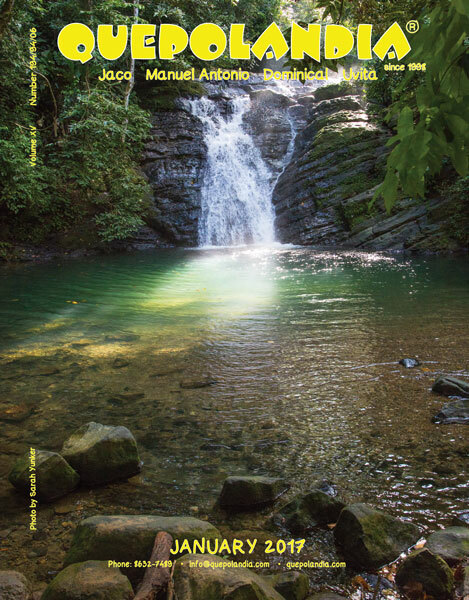 We want to thank Sarah Yunker Photography for the incredible waterfall cover. We are always looking for great new covers so please send your best shots to info@quepolandia.com for future consideration. Looking for great food, great drinks, and NFL Football. Stop in to Hawg n Bill or El Sol at the beach, Sanchos or Byblos on the mountain, or Double Hook at the Marina to catch all the games. We would like to welcome our new advertisers this month……. Arbol, Cafe Mono Congo/Phat Noodle, Funky Town Photography, Jackpot Sport Fishing, La Langosta Feliz, La Mansion, & Marco Surf School. We hope you enjoy our magazine and it helps guide you thru this enchanting paradise we call home. You can always follow and share us on Facebook. We appreciate and welcome your comments. Bienvenidos/ Welcome to paradise we are glad you have arrived. The rains are slowing, the sun is shining, and the jungle is alive… so let the fun begin. Our pages are full of awesome restaurants of every flavor Barba Roja, Z Gastro Bar or Victoria’s just to mention a few. Tour companies to take your vacation to the next level (Quepoa Expeditions, Skydive Costa Rica, Titi Canopy). Transportation companies (Monkey Ride & the Marina Pez Vela shuttle) that will get you where you are going. Not to mention great articles to enjoy while chillin at the beach or by the pool. The fish are jumping and so is Marina Pez Vela. 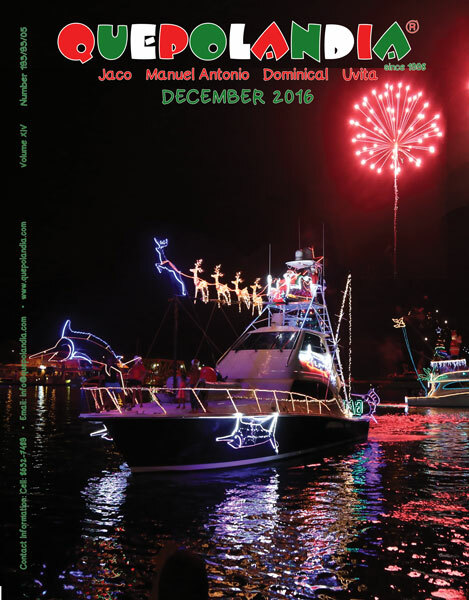 The annual Bright Lights Boat Parade is December 9, what a great way to start off the Holiday season and wrapping it with a Spectacular firework show to light up the skies of Quepos for New Years Eve so make sure not to miss it. Great time to feel the Pura Vida this country has to offer. Our shops are great for your holiday shopping. Check out La Tombola, Mot Mot Gallery and The Captain’s Booty for that one of a kind gift. Also lets not forget the Toys for Tots boxes in the area and help brighten someone’s holiday. We want to welcome our new advertisers: Adis Arquitectura, Blue Horizon, Costa Rica Luxury Real Estate, Mademoiselle Salon, Picador, Quepos Fishing Charters, Sunset Sails, and Vidis. We hope you enjoy our magazine and it helps guide you through this enchanting paradise we call home. You can always follow and share us at here or on Facebook. We appreciate and welcome your comments. We at Quepolandia want to wish our advertisers, writers, staff, and readers a Wonderful Holiday Season and an Incredible 2017!!! Bienvenidos… Welcome to the “Rain Forrest”, can’t say the brochure did not warn you. It will probably rain but don’t let that stop you. Manuel Antonio National Park is in full bloom which attracts frogs, hummingbirds and butterflies. Thank you Alissa Christine for the blue morph cover taken in the Butterfly Atrium at the Greentique Wildlife refuge here in Manuel Antonio and also your model and assistant Dina Tochluk and Marco Alvarado Porras. It is also baby season here in the jungle so look closely a lot of the monkeys and sloths are carrying young on their backs. The humpback whales and their calves are still here so get to Marina Pez Vela for many options to view them as well as world class sport fishing. Our rivers are also flowing so give Quepoa Expeditions a call for some thrilling rafting. Don’t forget the 6th Annual Quepos Open Tennis Tournament being held Nov 5-6 and 12-13 at the Tennis Club. Our many fine restaurants are serving up all your culinary delights, good idea to call ahead this time a year (phone directory page) We would like to wish everyone a Wonderful Thanksgiving, La Colina will be serving a traditional Turkey dinner on the mountain, Gabriella’s at the Marina, and Hawg and Bills Turkey and football at the beach. Toys for Tots will have their collections boxes around the area so let us help the children by dropping off an unwrapped toy to help brighten someone’s holiday…. Santa Clause cannot do it all himself. We would like to welcome our new advertisers this month: Blue Zone Reality, Double Hook Sports Bar, Hair by Monica, Jonathan Sequeira Segura Attorney, La Colina, and Puravida Rentals. We hope you enjoy our magazine and it helps guide you through this enchanting paradise we call home. You can always follow us here and on Facebook. We appreciate and welcome your comments. Bienvenidos…Welcome to the Rain forest, green season has arrived. So enjoy the peace of it and the greenness it provides. Our mornings are normally beautiful the rain comes later in the day so get moving early and maybe an afternoon nap (guilt free when it rains haha). Are restaurants and tour companies are in full swing to make your stay here unforgettable and without the crowds more enjoyable. Marina Pez Vela offers outstanding restaurants and tours. Great shopping and MOST important this time of year underground parking and shuttle service. We recommended calling ahead to our fine restaurants beforehand because some will be closing for a quick holiday for themselves and staff. Always love this time of year being from the US I always look forward to the start of the NFL season. Catch all the games at Barba Roja and Byblos on the mountain. Hawg and Bills and El Sol at the beach. We want to congratulate the Costa Rican Surf Team, Noe Mar McGonagle , and Jaco for an outstanding ISA Aloha Cup World Championship. The Tico team took the bronze in team competition. Noe Mar McGonagle brought home the bronze for Costa Rica in the individuals. We were fortunate enough to be there for the finals and Jaco deserves the Gold medal for hosting. The town was packed with surf fans from around the world and ended with a Cultura Profetica concert rocking the beach. We would like to thank Boris Marchegiani for our cover shot of one of the first babies born as part of the Scarlet Macaw reintroduction program at Gaia Hotel and Reserve. 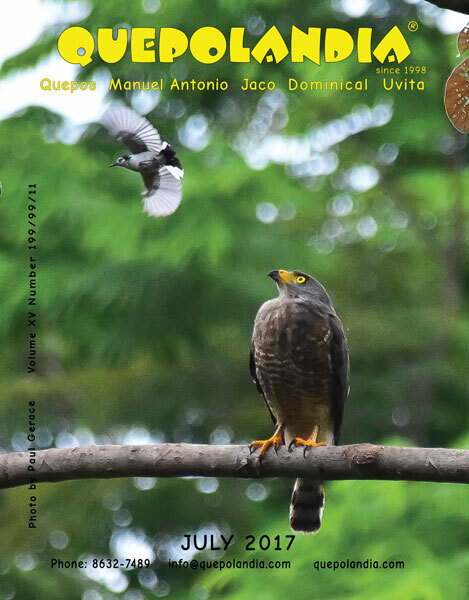 We also thank all its staff members and veterinarians Chris Castles and Ana Maria Torres for their work and dedication to bringing this beautiful species back into the skies of Manuel Antonio. October 31 is Halloween so get your costumes ready for fright night in the jungle. Marina Pez Vela will be having a Halloween Bash as well as many bar and restaurants around Manuel Antonio and Quepos. Also want to welcome our new advertisers Blue Restaurant & Social Lounge and Pura Vida Pest Control to our pages. 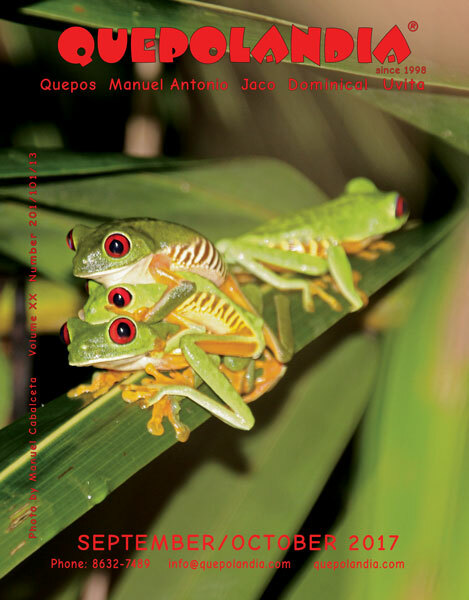 Sept/Oct is a double issue here at Quepolandia so we will be back to guide you in November. We hope you enjoy our magazine and it helps guide you through this enchanting paradise we call home. You can always follow and share us at Quepolandia.com or on facebook. We appreciate and welcome your comments. Bienvenidos…Welcome to our piece of paradise. We are sure you will have a great time. There are so many wonderful things Costa Rica has to offer and we have them all right here. Amazing beaches to stroll or fly with Aquas Azules Parasailing. World class sport fishing and a fleet of boats waiting for you at Marina Pez Vela. Congratulations to Roy Zapatao for your world record 51 lb. Snook. (see article pg. 44). We have tours from skydiving (Skydive Costa Rica) to scuba diving and everything in between. Whether you want to relax and enjoy the nature and wildlife on a mangrove tour or for a little more adrenaline try white water rafting ( Quepoa Expeditions). Our mangroves and rivers are as magical as our coastline. To experience the jungle canopy there is nothing like ziplining ( TiTi Canopy tours). Or the first of its kind EcoTram at Hacienda Baru( tell Jack we sent you). August is whale season so while you are enjoying a cocktail at our many restaurants with a view pay attention to the coast you never know when a family of Humpbacks will go swimming by. We want to welcome the ISA Surf World Championships to Jaco August The Costa Rican surf team will be defending their World Title which they won in Nicaragua in 2015. The surfing will be world class as well as the destination, what better way to defend the title then to have home field(ocean) advantage. So lets go out and support the CR surf team to another World Championship. Thank you Paul for the amazing cover. VIVA COSTA RICA!!! We would also like to wish all you mothers a Happy Mother’s Day. We would not be here if not for you. So don’t make mom cook take advantage of our incredible selection of restaurants. She probably would not mind a massage or mani pedi either. I would also like to welcome our new advertisers Tico Pod Art Gallery, Coral Yacht Adventures, Monkey Ride and The Kayak Lodge. NOW a few words from Dave: Well you are a tuff act to follow. I am honored to be carrying on an area tradition that I have read, shared and loved for many years. Looking forward to helping the wonderful business connect with our incredible guests. I want to thank Mari Borge for the cover photo. Please continue following on fb and Quepolandia.com Thank you Pat for being you and for everything you have done for the community. I hope to make you proud!! !